Hypersomnia is a disorder characterized by excessive amounts of sleepiness. Those who suffer from hypersomnia have recurring episodes of excessive daytime sleepiness which is different from feeling tired due to lack of or interrupted sleep at night. They are compelled to nap repeatedly during the day, often at inappropriate times such as at work, during a meal, or in conversation. These daytime naps usually provide no relief from symptoms. 1. Treat sleep disorder causing hypersomnia: Whether you suffer from sleep apnoea or insomnia, not getting a full night's sleep will cause you to be drowsy during the day. Dealing with your pre-existing sleep disorder will likely eliminate the problem of hypersomnia. 2. Lose weight and change your exercise habits: Being overweight can play a part in snoring and sleep apnoea which is linked to hypersomnia. Being overweight also has a profound effect on your energy level. Get regular exercise, at least 20 minutes of walking a day, to increase your energy level. An increased energy level will translate into increased alertness throughout the day. 3. Avoid drugs and alcohol: Drugs and alcohol can have a marked effect on daytime sleepiness. Depressants are known for creating drowsiness, as is alcohol. Avoid taking anti-histamine medications which can cause drowsiness unless they are prescribed by a doctor. 4. Get enough sleep at night: An adult should get approximately 8 hours of sleep each night. Avoid exercise or stimulating activity in the hours just before bed, and establish a relaxing bedtime routine. 5. 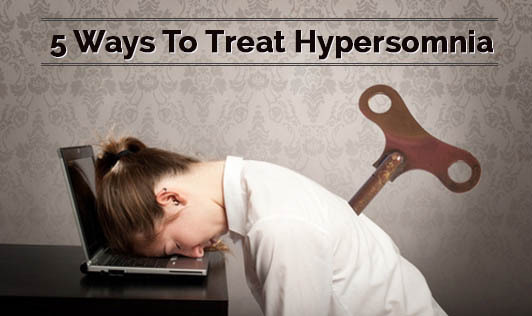 Identify and treat all head injuries: Head injuries can contribute to the onset of hypersomnia. If you have been in an accident or even just bumped your head recently and feel as though you're drowsier during the day than usual, speak to a doctor right away. This could be indicative of a larger problem, such as a concussion or other head injury.